What is a Radical Pen? Radical Pens - from Premec Switzerland - are a funky new pen imagined by the BMW team at DesignWorksUSA. 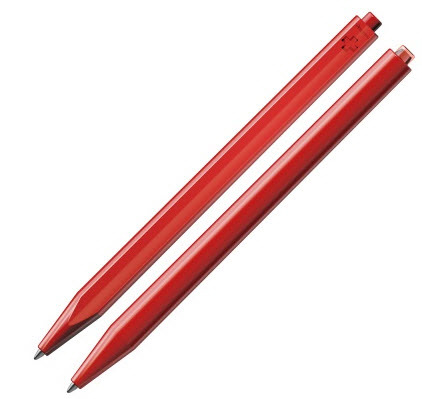 With sleek lines and clip-less body, this radical pen range has a long flat print surface ideal for web address etc... Available in a host of finishes and colours, the Radical Pens from Premec have a long writing ballpoint ink of 1200 metres, with an optional, smooth, Gel ink also available. For those wanting to develop Promotional Pens that are true to Brand, PMS colour matching is available on orders of 15,000pcs. Solid Polished Radical Pen Quality retractable Swiss pens with a gloss finish. Value Price Point. Exclusively designed by BMW Group subsidiary Designworks USA, the Radical Pen has an attractive unconventional shape, vivid colours and harmonic lines. The sleek lines of Radical are accentuated by the omission of a clip. Offering 2 distinctly different print areas Front: a long flat surface which is perfectly suited to long text (eg - web, email and street addresses) Back: the curved side of the pen can have a 120 degree roll print applied for large graphics and logos. Available with a choice of Ballpoint or Gel ink refills FACTORY DIRECT - CUSTOM MADE OPTIONS Create your own unique Radical pens by combining the following options, direct from the factory.